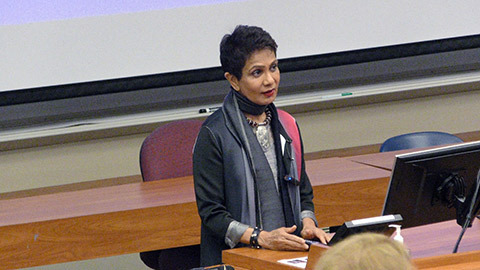 Azra Raza, M.D., spoke on "History of Cancer Research: Why Patients are Still Dying for a Cure" as part of the Annual S. Amjad Hussain, M.D., Visiting Lecture in the History of Medicine and Surgery. Dr. Raza is Chan Soon-Shiong Professor of Medicine Director at the Myelodysplastic Center at Columbia University Medical Center in Manhattan, New York. The University of Toledo created this annual lectureship in the history of medicine and surgery to honor Dr. S. Amjad Hussain’s deep interest in many diverse fields, including the history of medicine. Dr. Hussain holds emeritus professorships in thoracic and cardiovascular surgery, as well as humanities at The University of Toledo.